Longtime B-western favorites Tex Ritter and Ray "Crash" Corrigan are among the supporting players of the Columbia oater Apache Ambush. Star of the proceedings is Bill Williams, cast as Indian scout James Kingston. In the last days of the Civil War, President Lincoln (James Griffith) selects Kingston and two other men -- cattle driver O'Roarke (Ray Teal) and "reconstructed" Confederate major McGuire (Don C. Harvey) -- to help speed along a major cattle shipment from Texas to the Northern states. 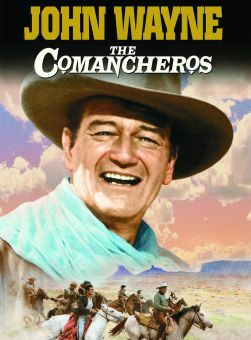 One of the obstacles facing the three men is Mexican fanatic Joaquin Jironza (Alex Montoya), who wants to get his hands on the Henry Repeating Rifles which Kingston and his confreres carry with them. Undermining the good guys is embittered ex-rebel Lee Parker (Richard Jaeckel), who is in cahoots with Jironza. 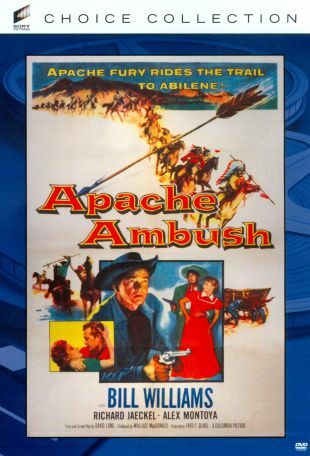 So much happens in the first five reels that the titular Indian ambush is almost anticlimactic (a warning to more sensitive viewers: neither the Apaches nor the Mexicans are shown in a particularly sympathetic light).